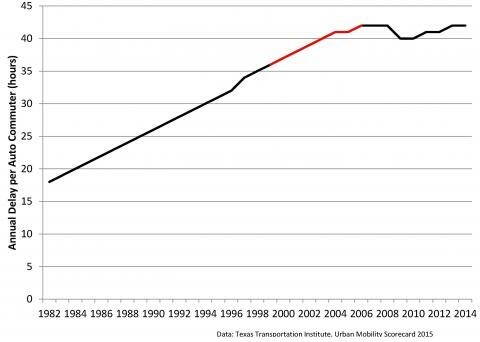 Focusing on the peak period, as the Texas A&M Transportation Institute does, can miss the big picture. The lens you use to observe something says a lot about what you’ll see. If you examined the human condition only during the hours of 10 p.m. to 6 a.m., for instance, you might find a species that isn’t terrible productive for a full third of the day. Your response might even be to call for the elimination of sleep as a way of improving economic growth. The Texas A&M Transportation Institute, which puts out a regular ranking of rush-hour traffic congestion in U.S. metros, suffers from a similar myopia. It’s true that morning and evening commutes are a special form of hell with negative impacts on health and well-being. But by focusing on the narrow window of the peak period, the institute’s “Urban Mobility Scorecard,” as this year’s version is called, doesn’t actually do a good job scoring urban mobility—and instead arrives at some solutions that could hurt it. "You can do little things like stagger work hours, fix traffic-light timing and clear wrecks faster, but in the end, there's a need for more capacity." Since 1994, all but one of the top 100 places studied by the Texas A&M researchers saw congestion get worse, as measured by their Travel Time Index. Yet during that time, 92 of these places saw an increase in the amount of roadway miles per capita. … Yes, more road building in order to try to move vehicles faster often makes traffic worse. Relying on highway expansion creates problems beyond more traffic—namely, a strain on transportation funding. Building new roads not only costs construction money now but it costs maintenance money later; a general failure to prepare for this full lifecycle of expenses explains much of America’s current infrastructure crisis. Additionally, in allotting so much money to the few-hour window that is rush-hour, local government finds itself without sufficient resources to provide mobility to the other 80 percent of travel that occurs outside the peak. So by reducing urban mobility to rush-hour commuting, you’re missing the 20-some hour window of the day where metro areas have an underused (if not ghostly) roadway system as well as an underfunded city transit system—whose poor performance ironically leads more people to rely on cars. If you examined the traffic situation during this lens, you’d reach a much different set of conclusions. Again, that’s not to say rush-hour traffic isn’t an economic drain or an emotional drag; it truly is. 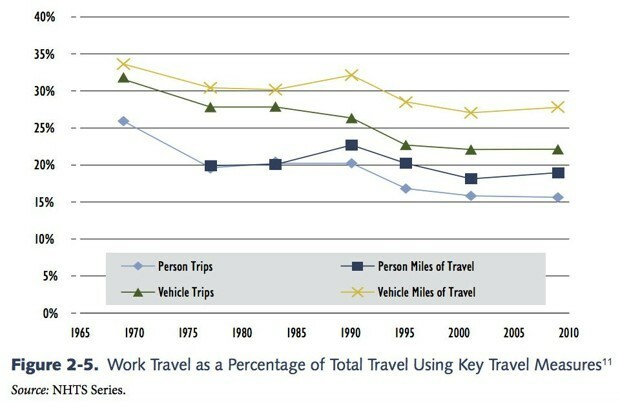 But it’s not entirely clear that commuter traffic is getting much worse over time. Joe Cortright at City Observatory, who has diligently tracked critiques of the mobility report, suggests the actual increase in congestion between now and 2030 will be a “trivial” 25 seconds per average commute trip. To the extent that rush-hour traffic remains a problem, highway expansion is far from the only answer. Cities can discourage peak period driving by putting a price on it—either in the form of tolled lanes or congestion charging zones. They can also offer a discount for people who travel at off hours, or reserve existing lanes for buses that carry way more people, or encourage major employers to alter work schedules and reward alternative commutes, or generally shift planning focus toward development more suited to public transportation. The Texas institute is coming around. In chatting with the Washington Post about the latest report, Tim Lomax acknowledges the limits of road expansion: “We need to figure out how to use our existing capacity smarter.” Meanwhile, other researchers—with Minnesota’s Accessibility Observatory leading the way—are now mapping job access instead of just quantifying gridlock to show why the rush-hour battle is often worth it. Nothing like looking at an old problem from a new perspective to open your eyes. ALPERN AT LARGE-You know, it's indeed possible that there will be enough voters who won't remember (or care about) the current shenanigans and budget games in the City of LA--enough to allow a 2/3 vote to pass a new sales tax measure in November 2016. Then again, maybe enough voters will remember, and the initiative will (like its predecessor Measure J) fail to reach the 2/3 mark and fail. And then you can kiss a 2024 Olympics goodbye. For the City of Los Angeles to be prepared for any 2024 Olympics, we'll need a "Measure R-2" to ensure enough funds to create the long-sought LAX/Metro Rail link, as well as any other Measure R project like the Downtown Connector and the Wilshire Subway, to be expedited and completed. Sidewalks and roads will need to be repaired, and the county will have to work together to make this 2024 Olympics tourist-friendly. And this will mean having the constituents--you know, the voters, the taxpayers, the citizenry--on board with their minds, hearts, and wallets open. Hence the slap in the face to the Neighborhoods Councils' Neighborhood Budget Advocates was either stupid or calculated on the part of Mayor Garcetti. Not allowing the Neighborhood Councils access to budgetary issues affecting road repair and other City services? And you're going to ask Neighborhood Councils to support a "Measure R-2", Mr. Mayor? You're also going to ask Chambers of Commerce to support a "Measure R-2", Mr. Mayor--especially when City Hall just rammed a minimum wage hike (with a host of good intentions...but also with a host of horrific unintended consequences) without proper study down these Chambers' throats, and against their stated pleas? I'd say most of the taxpayers view Measure R-2 (which I'd love to support but which is becoming doggone hard to get behind at this time) as a way to build more rail and road projects, and to repair LA's infrastructure...and to prepare for the 2024 Olympics, to boot. But how many City of LA employees view Measure R-2 as a way to fund their next raise, coming after an obscene decade of giveaways between 2000-2010 for which Angelenos will suffer for decades? Did not Mayor Villaraigosa hamstring his own mayoral tenure by throwing out public sector union giveaways at the start of his first term? Perhaps Mayor Garcetti and Council President Wesson are sick of hearing fellow CityWatch contributor Jack Humphreville complain about Downtown leadership shaking down and soaking taxpayers and ratepayers (but, then again, I repeat myself because ratepayers are just indirectly paying more taxes...and more taxes...and more taxes regardless of what they're called). And maybe voters and taxpayers are just too distracted by Donald Trump, Bernie Sanders, the Kardashians, the Duggars, Caitlyn Jenner, Ashley Madison, world events, zombie series on TV, and their personal lives. But November 2016 (it's just a little over a year away) will come around sooner or later, and then City Hall and the Mayor will need to convince the voters that a "Measure R-2" is a good thing. A necessary thing. A long-overdue thing. And then it will be evident for all to see whether there are enough distracted voters who will pay even more for a "Measure R-2" to prepare for the 2024 Olympics. Maybe they will have been distracted, and will be ready to vote for more taxes after all that's going on with budgetary and utility rate-related mischief. And maybe enough weren't distracted, and they won't have that frame of mind. 2/3 of the voters is a rather high threshold to overcome what's currently going on with our City's financial decision-making.